Ever want to read a self-help book with advice garnered from David Foster Wallace? This is your book. I came across this book by searching for how to make cleaning fun. While not a how-to manual, I found the book intriguing enough that I thoroughly enjoyed its diversion. 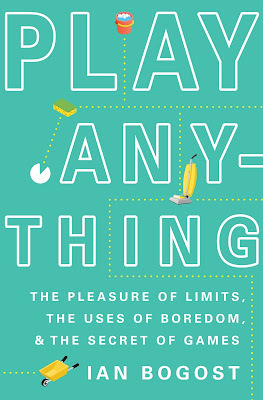 Bogost offers a paradigm shift on how to think about play. We usually think of play as the opposite of work or doing exactly what we want to do. 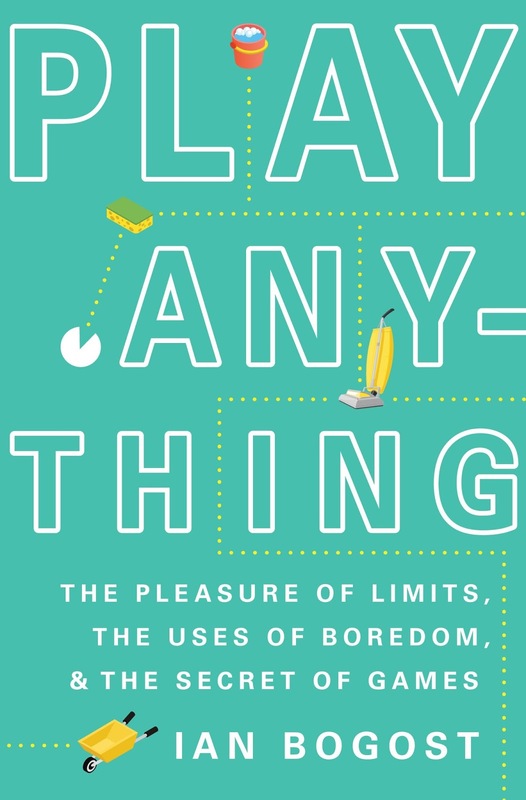 Instead, Bogost argues that play is taking things seriously as the things-themselves and operating mindfully within constraints. One of the examples he gives of this is a three-day tennis match. The players were so committed to their game that neither of them would concede to the other. This case certainly seems to be filled with more seriousness than levity. And when we look at idiosyncratic versions of fun, it can be even more difficult to pinpoint why they are fun. I enjoy organizing books. Why? I enjoy most things to do with books, but this answer seems to be sidestepping the question rather than provide a good explanation. One of the things I really appreciated about this book is that the author is a video game designer, but he uses a lot of example besides video games as examples of play. Even when he discusses video games, a lot of his analysis focuses on the constraints of programming languages or user interface, so it doesn't bogged down in talking about how Mortal Combat is awesome. He uses the analysis he has employed to make playable games to apply to other realms not as obvious as play. For example, he spends quite a bit of time talking about lawn care. The book organizer in me relates more to this example than if he had obsessed about video games even though I don't share either interest. Bogost offers several paradigm shifts that I found intriguing. He proposed a new relationship to things. Austerity is the opposite of abundance, but it doesn't escape the material continuum. Instead of appreciating things for their full potential, you're trying to get rid of them. In the case of abundance, you appreciate things because you're always seeking more. Instead of trying to make things do what you want them to do for you, you should learn to appreciate them as they are. This can be applied broadly to objects, situations, and relationships. You do have to get pretty far into the book until he offers his suggestions on how to be playful, which is a minor critique, but I guess also par for the course as books go. I was surprised at how many negative reviews this book has acquired. I thought it was well-written enough that I found myself quoting lines. The lines were difficult to extract because so much of the context was significant and relevant. It also thoroughly referred back to previous examples in a way that I found informative and not redundant. This book will help you think about ennui in new ways that could evolve into an overall more playful approach to life.